8:20am - Today, the first class of the day is Engineering with Subject Expert Teacher Mr. Huneycutt! Last week, the students started learning about the physics behind catapults, and today they are having a second lesson to practically apply their knowledge. Using a ruler, eraser, and fulcrum, they construct tiny catapults and test which placements of the three items yields the farthest distance traveled for the projectiles. "What is different when you use a larger fulcrum?" Mr. Huneycutt asks the class. "It went further," says Zoe, of the eraser projectile. "It went higher," Jiahao agrees. 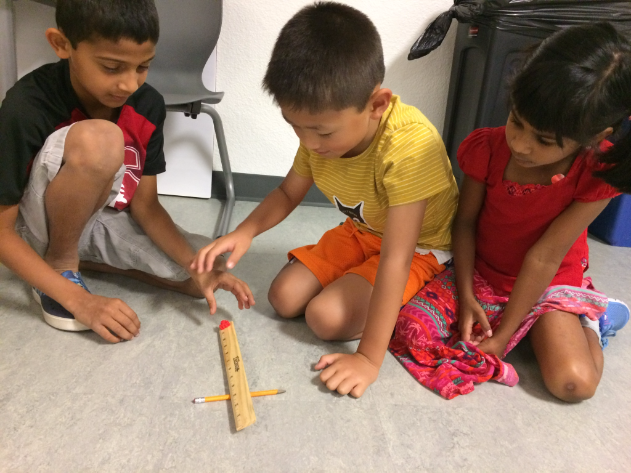 In pairs or trios, students experiment with their catapults by adding different or additional fulcrums. Erasers fly all over the room, and a few even hit the ceiling! "What did you observe during your experiment today?" Mr. Huneycutt asks after the first round of tests. "At seven inches it went really high," Albert says, referencing how his catapult's fulcrum was placed at the number seven on the ruler he was using as the catapult's arm. 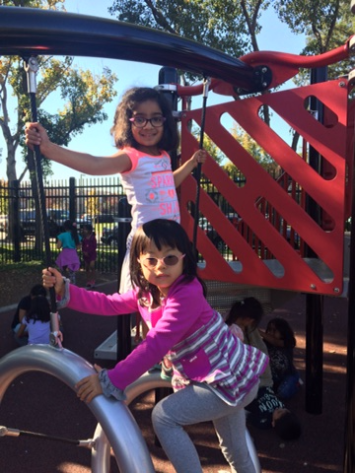 "It went a little bit farther and higher than the little one," Manasvi says of her group's larger fulcrum. "At three inches, it went as high as me!" says Henry, referencing, like Albert, the number on the ruler at which the fulcrum was placed. Mr. Huneycutt shows the class what happens when he uses two fulcrums instead of one, and what happens when he places them close together versus far apart. Then, the students draw their own hypothetical catapults from the top and the side. Their concepts must include items from the class supply shelves, and they must label their illustrations with the materials they would use. 9:45am - Recess time! 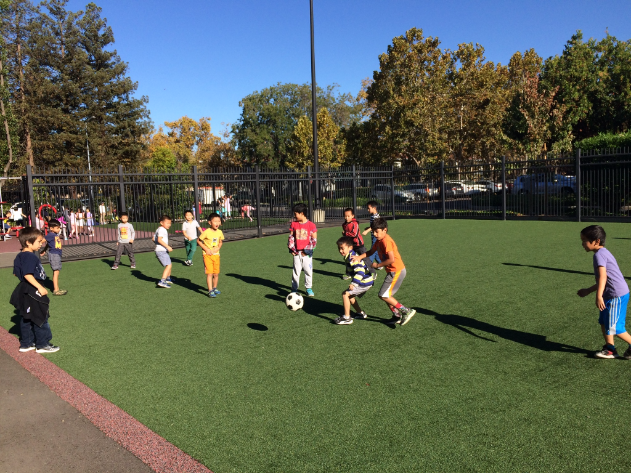 Soccer is today's sport of choice. 10:05am - Carbon's next class is Math and Science with Ms. Gousia. Today's lesson is about money and fractions and using the two in math problems. 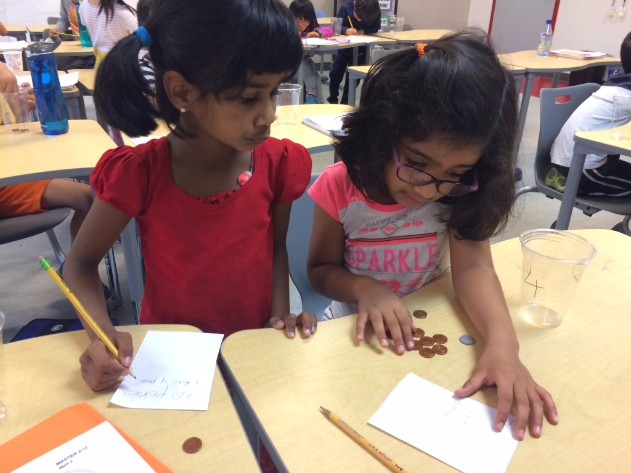 The students write number sentences to break out different math problems, for example, 16 pennies = 1 dime and 6 pennies. "Imagine you are getting a receipt at a store," Ms. Gousia says to illustrate the day's goal. She reviews an addition worksheet with the class while Mr. Wagoner works with a student who has questions about the day's lesson. Ms. Gousia polls the class to create a quick bar graph about their apple preferences so they can answer questions on the current worksheet. 11:15am - Brain break! Time for a move-and-freeze video to get some energy going and practice following directions. 11:20am - For the last few minutes of class, students review a new page in their science textbooks. Today's lesson is about flowering and non-flowering plants. They take turns drawing some examples of plants with flowers and plants without flowers. "Let's practice our compliments," Mr. Wagoner says to the class as they line up to leave. 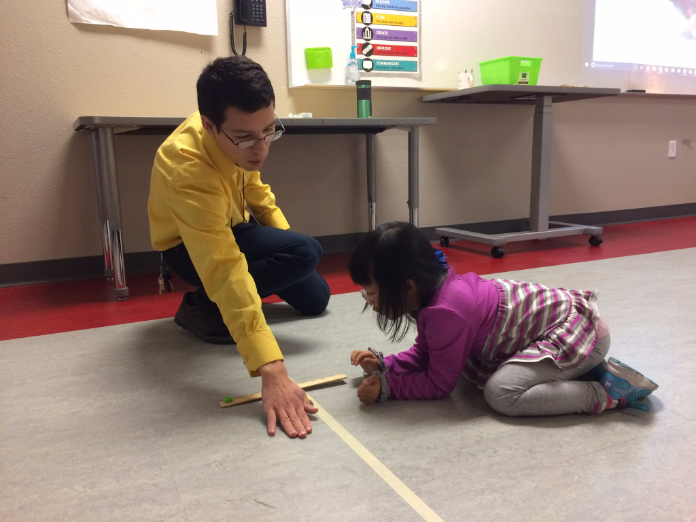 "I like how you teach," Peisho says to Ms. Gousia before leaving the room. The students walk to the cafeteria and enjoy their respective meals. 12:20pm - In READ class today, Mr. Wagoner is using the day's reading of Roald Dahl's The BFG to practice using context clues to work out new vocabulary words. "What does 'sprawled' mean in the context of the sentence?" Mr. Wagoner asks after reading a line about the giants' sleeping arrangements. He mimes the word with exaggerated limb movements when students guess that it means to be lying down. "I must admit, that never occurred to me," reads Mr. Wagoner, as the character Sophie. "What does 'admit' mean in the context of the sentence?" he asks the class. The students have several guesses, and Mr. Wagoner further explains, "'Admit' is a special type of talking, where you say something you don't want to say." 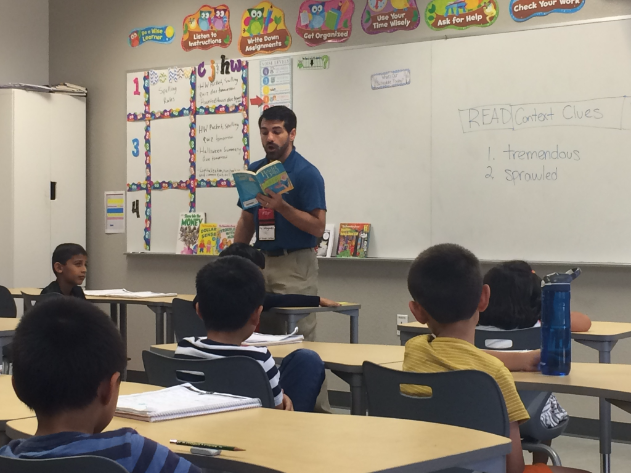 Throughout the lesson, Mr. Wagoner asks questions about the characters and plot to maintain engagement with the students and make sure they understand the story so far. When he is done reading today's chapter, Mr. Wagoner asks the class to look ahead. "Let's do two minutes of prediction. What is the BFG planning to do?" 12:45pm - Next is Humanities with Ms. Wagner. Class begins with a Do Now assignment to practice -ck and -k endings. "Is this vowel alone?" Ms. Wagner asks a student, pointing to their worksheet. "Add a 'c' before the 'k' to give it a friend!" As students finish their Do Now work, they go over to Ms. Wagner's reading corner to find a book to quietly find a book to start while waiting for the rest of the class to finish their work. Ms. Wagner summons the class back to their desks to have a follow up lesson about mastabas, a concept that was a challenge on the first test of the year. A mastaba is a type of Egyptian tomb, and several students fix on its visual description and think it is a bench. "Mastabas looked like very large benches, but just because something looks like something else doesn't mean they're the same thing," Ms. Wagner explains. "Hailey, what is a mastaba?" she asks, picking a random student later in the lesson to quiz. "A mastaba is a tomb that looks like a bench!" Hailey replies without hesitation. To finish the lesson, Ms. Wagner has students draw and label a mastaba or write a description of a mastaba. When everyone has finished, they enjoy a brain break video! Next, students work on their haunted house project, where they have been writing descriptive paragraphs about their haunted house and creating a picture of it with construction paper. 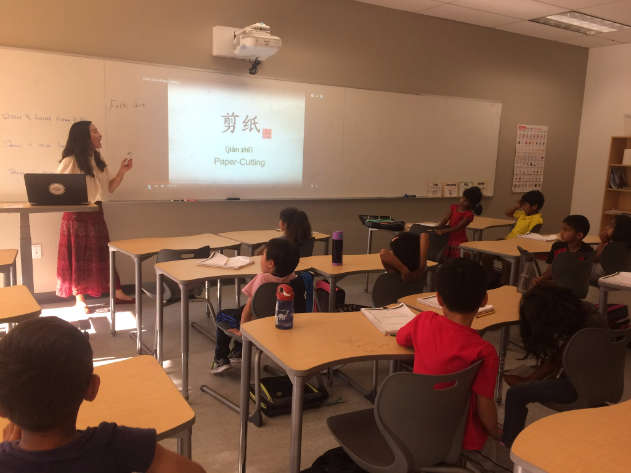 2:30pm - For Mandarin, students in the first grade Carbon class join with the first grade Nitrogen class, then split into two classes, one for heritage speakers and one for non-heritage speakers. Today in the non-heritage speaker class, Ms. Yu is presenting a lesson about Chinese folk art. "What is folk art?" she begins by asking the class what they think it is, then shows some examples of cut paper designs and Chinese shadow puppetry. 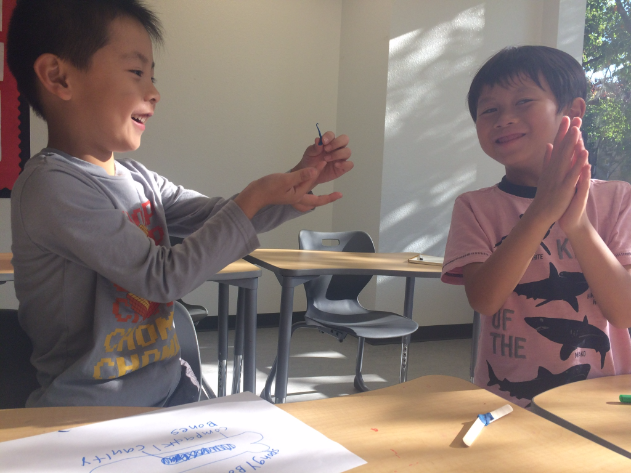 Students learn some corresponding words, then Ms. Yu shows them a video of sugar painting and sugar blowing techniques. Everyone watches with wide eyes as a sugar blowing master turns a glob of molten candy into a balloon-like doe. 3:10pm - Time for Phys Ed! The class lines up with all their things for dismissal and leaves everything in the hall outside the multipurpose room, since Phys Ed is their last class of the day and they are dismissed directly from it. 3:15pm - Both first grade classes have PE at the same time, so Coach Andy and Mr. Miller divide them in two groups by class so there is more room to run around safely in the multipurpose room. The Carbon class goes with Coach Andy for a lesson about muscle groups, and Mr. Miller leads the Nitrogen class in a game of Ultimate Football. In a classroom, Coach Andy uses tongue depressors and Play-Doh to illustrate to the students how bone breaks and heals. Each student has the same materials so they can follow along. 3:50pm - Coach Andy dismisses Carbon to the Late Bird program or to their parents. 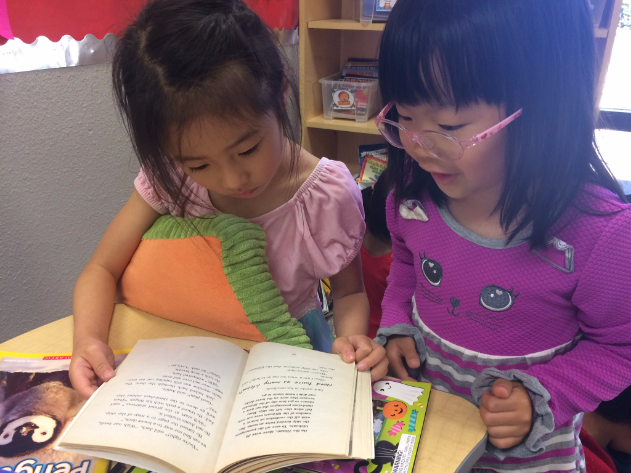 First graders at BASIS Independent Fremont enjoy the full benefits of the Learning Expert Teacher/Subject Expert Teacher model that creates an environment where students are taught by a variety of teachers who each have a passionate specialization. Each subject is taught by an expert in that field, and the first graders benefit from having a dedicated Learning Expert Teacher with them all day long, who has a strong background in early childhood education and can track each student's progress and needs. 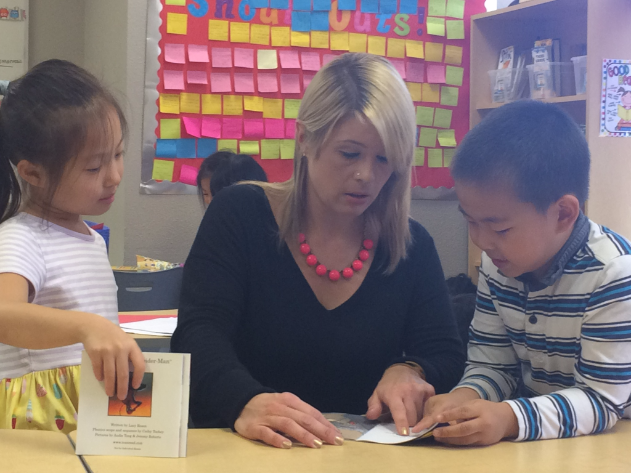 "Our first grade classes prove the strength of our two-teacher model," says Dr. Ashley Leyba, Head of School at BASIS Independent Fremont. "The students are very young, but are able to thrive in our advanced curriculum with this specialized attention and teaching."